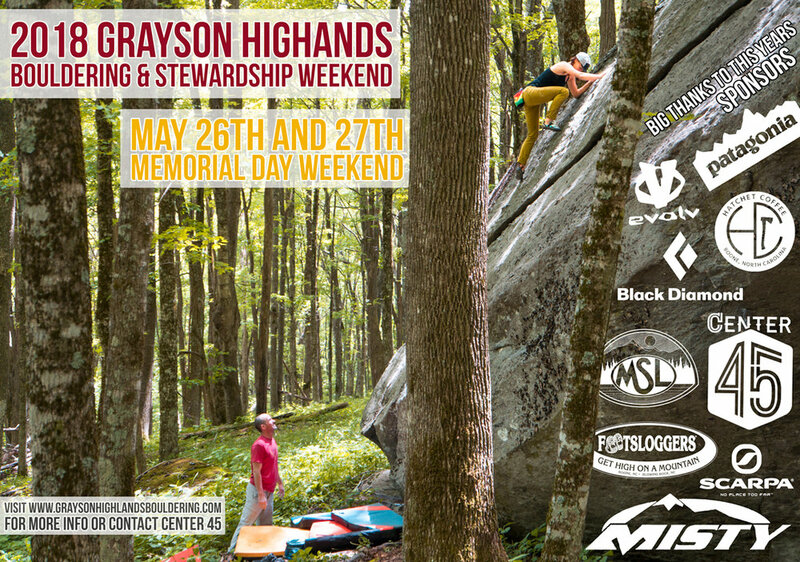 Maybe you are new to bouldering or possibly you spend more time at Grayson Highlands than Fabio (GHSP Most Majestic Pony) either way this Bouldering and Stewardship weekend is for everyone! Join us as we head up to Grayson to give back to this awesome state park with boulders from all over to a little work in between bouldering sessions! It's also a great time to sample new areas of the park that aren't in the guidebook but maybe you have noticed on Mountain Project but aren't exactly sure on how to locate them! Last year we had 20 hard working folks come out and add a climbing access trail to the Luminary Boulders as well as some maintenance on the Listening Ridge Trail Boulders! Not only that but its free admission to anyone who comes out for the work day as well as a sweet camp spot only opened to climbers for this event each year which is located close to the Ranger Rick Boulder so bring the head lamps for some night bouldering! Contact Aaron Parlier at Center 45 in Boone NC for more info!